SAN ANTONIO--(BUSINESS WIRE)--Jan. 9, 2018-- NuStar Energy L.P. (NYSE: NS) announced today the start of its Binding Open Season involving a second capacity expansion of NuStar Permian Transportation and Storage LLC’s Permian Crude System. With crude oil throughput volumes to certain destinations on NuStar’s Permian Crude System approaching the system’s capacity, the NuStar Permian Crude System Expansion No. Two will provide shippers with additional transportation capacity that is capable of reaching multiple downstream markets through interconnects at Colorado City, Texas. The NuStar Permian Crude System Expansion No. 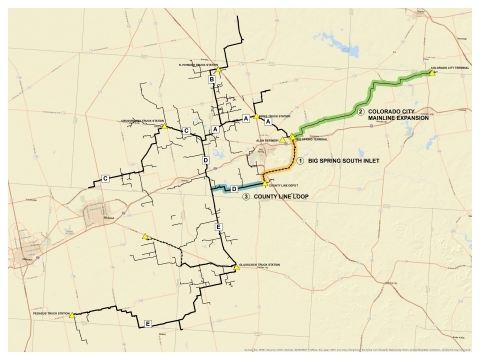 Two is currently expected to consist of three phased-in expansion projects, including: Big Spring South Inlet; Colorado City Mainline Expansion; and County Line Loop. Once completed, these projects are expected to provide approximately 70,000 barrels per day of additional capacity on the Permian Crude System, of which 90 percent of such additional capacity will be available for volume commitments during the Open Season. Under the NuStar Permian Crude System Expansion No. Two Open Season, potential shippers will have the opportunity to make volume commitments and sign a Transportation Services Agreement (TSA) from designated origin point segments to NuStar’s Colorado City, Texas Terminal at tiered-volume committed rates. Subject to the limitations set forth in the TSA, shippers that execute a TSA during the Open Season will also have the option to elect firm transportation rights on NuStar’s Permian Crude System during periods of prorationing for those movements for which shippers have made volume commitments. The Open Season commences on January 9, 2018 at noon CST and will extend for at least 30 days. The Notice of Binding Open Season is available on the NuStar Energy L.P. website at www.nustarenergy.com. Interested potential shippers that would like to receive more information about the Open Season, including the TSA, information about rates, service and routes must sign a confidentiality agreement. A copy of the confidentiality agreement is available by contacting Megan Acker, Senior Manager-Business Development, at (210) 918-2000 or PermianOpenSeason@nustarenergy.com. NuStar’s Permian Crude System currently consists of approximately 625 miles of crude transmission and gathering lines, spanning Borden, Howard, Martin, and Midland Counties with delivery points into Midland, Colorado City, and Big Spring, Texas. NuStar Energy L.P., a publicly traded master limited partnership based in San Antonio, is one of the largest independent liquids terminal and pipeline operators in the nation. NuStar currently has more than 9,300 miles of pipeline and 81 terminal and storage facilities that store and distribute crude oil, refined products and specialty liquids. The partnership’s combined system has more than 96 million barrels of storage capacity, and NuStar has operations in the United States, Canada, Mexico, the Netherlands, including St. Eustatius in the Caribbean, and the United Kingdom. For more information, visit NuStar Energy L.P.’s website at www.nustarenergy.com.